#1: Paying under the table. Paying your nanny or caregiver under the table may seem convenient, but it could have big consequences when it comes to tax time. There are penalties and fees associated with paying a household employee under the table. Your employee is entitled to fair wages and should be entitled to certain benefits, as well as being covered under worker’s compensation laws, which are paid by you as the employer. This is done by paying the employee and withholding proper taxes. If you are unsure of how to do this, we can step in and help. Our team at HomeWork Solutions is experienced in all of the state and federal laws and will take care of paying your employee each paycheck, withholding the proper amount of taxes so there are no surprises at tax time. #2: Calling your caregiver an independent contractor. Hiring someone as a caregiver means you are hiring them as an employee, not an independent contractor. Your household employee must be given a W2 form each year for tax and wage reporting and as an employer, you must pay for social security and Medicare taxes, as well as federal unemployment tax. For any person that is earning more than $2,100 per year, they are considered an employee for tax purposes and if you misclassify the employee as a contractor, you could be subject to penalties and fines. If you are confused on the difference between an employee and an independent contractor, our team at HomeWork Solutions can get you up to speed. Did you know that 38 states require household employers to have a workers' compensation insurance policy? Overlooking this can be an expensive mistake! When you get caught in New York, for example, the penalties are $2000 ever 10 DAYS you were without the insurance! 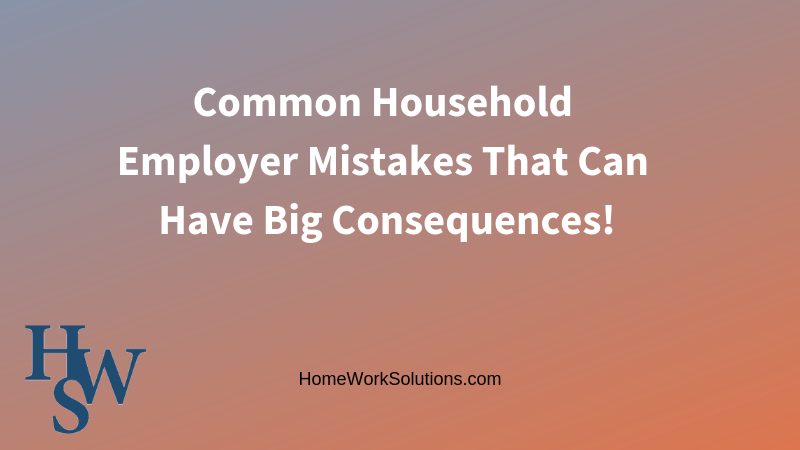 Worse if your employee suffers a workplace injury and you are uninsured, you will be personally responsible for her medical costs and lost wages. Workers' compensation insurance is commercial insurance and cannot be obtained through personal insurers such as GEICO and USAA. HomeWork Solutions' insurance partner stands ready to help our clients obtain this insurance at the best rates. #4: Failing to get auto insurance squared away. Did you know that if your caregiver or nanny drives your car, she should be added to your auto insurance policy? If she uses her own car, she should be insured to cover her business use. It is up to you to get these things squared away so you can be insured properly in the event of an accident. If you don’t, you could be subject to costly repairs and or medical bills that could come unexpectedly. Hiring a household employee comes with responsibilities, especially in the area of taxes and payroll. Our experienced team at HomeWork Solutions is standing by to answer your questions and make sure that you have everything covered so when it comes time to pay your taxes, there are no unfortunate surprises. Contact us today for information.